Understand how learning happens both in and outside the classroom and how to develop instructional designs that support this learning through the master’s degree program in Learning and Design at Vanderbilt University's Peabody College. Through this 10-month-long program, you’ll work to discover how learning happens across diverse settings and how to bolster and enhance it. You’ll create and study environments that have impact across scale, time, and context. how to design learning environments and activities to support learning. The Learning and Design M.Ed. program is planned as an immersive instructional design program spanning mid-July to graduation the following May. Coursework is directly connected to schools, libraries, and community organizations to support your cohort in exploring connections and implications of theory in practice. If you are a medical student interested in further training, expertise, and immersion in educational theory and practice while in medical school, you can complete a joint master’s degree in education (M.Ed.) and an M.D. degree. The joint degree program takes about five years to complete. You must apply to the M.D. and M.Ed. programs separately and must be accepted by both programs to pursue the joint degree. Program Director: Kristen Neal, Ph.D.
* We will continue to accept applications after this date, but applications will be evaluated for admission and scholarships as space and funds are available . Graduates of the Learning and Design program choose careers that include classroom teacher, instructional design leader, curriculum designer both for schools and for out-of-school-settings like museums and libraries, leader of non-traditional learning experiences, and education specialist. Some pursue doctoral degrees in Learning and Design. 100% of Learning and Design graduates were employed or attending graduate school within four months of graduation. 2nd Grade Teacher, High Tech Elementary, San Diego, Calif.
3rd Grade Teacher, Tollgate Elementary, Aurora, Colo.
Editor, Educational Resources, Barnes & Noble, New York, N.Y.
Education Project Specialists, Disney, Lake Buena Vista, Fla.
Head of Boys Campus, Wolfeboro Camp Schools, Wolfeboro, N.H.
Instructional Specialist, Vanderbilt University, Nashville, Tenn.
Instructional Technology Coach, USAID - Qitabi, Beirut, Lebanon, Tenn.
Middle School Humanities: HR Assistance, Cape Henry Collegiate, Virginia Beach, Va. Learn more about Peabody Career Services. The fieldwork component is central to the Learning and Design graduate program, allowing you to explore what instructional design actually looks like in different contexts, not just the theory behind it. local nonprofit organizations working with homeless, immigrant, and refugee populations ( Conexión Américas , Oasis Center, Nashville Rescue Mission). The learning core focuses on theories of learning and their application and implications in formal and informal settings. These theoretical perspectives provide the foundations for the design work. The design core explores implications of the learning core through a user-centered design process, which emphasizes the importance of interacting with users from the very beginning of the process. The diversity core drives and informs both the learning and design cores. You’ll complete 15 credit hours from any graduate level course in any department, college or university for which you are able. At least one of these electives will have a primary focus on diversity and at least one will have a primary focus on design. 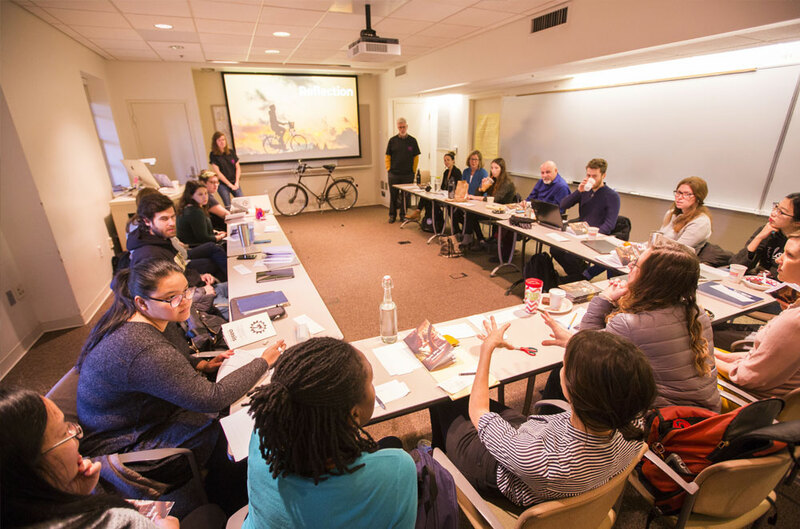 Department faculty come to Peabody College with years of experience in the classroom and a commitment to research that supports student learning. Current faculty research the design of learning environments, responsive curriculum design, and family and community engagement in the schooling process, among other topics.